The Introduction, as its title suggests, provides a brief highlight of the key issues affecting tourism. 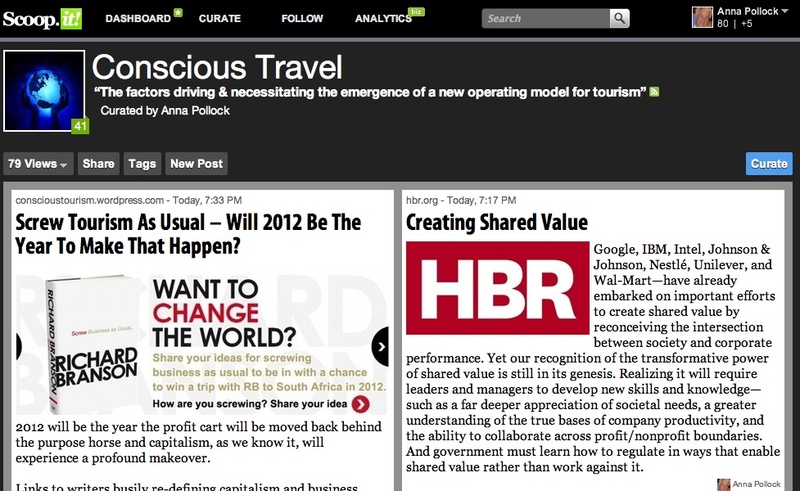 Why Conscious Travel – looks at both the need for an alternative vision and why the term “conscious” has been used. In the Challenge of Industrial Tourism I talk about the need for industry to “wake up” and “grow up” so the most relevant posts to this conversation are: Good Morning Tourism Time For Your Wake-up Call, Parts One & Part Two. The video What is a Conscious Host highlights those attributes that an operator could develop in order to attract travellers that are also awake, aware and alert. What is a Conscious Host? Is Conscious Business “Capitalism 3.0”? Dr. Jean Houston, scholar, philosopher and researcher in human capacities, and one of the foremost visionary thinkers and doers of our time and principal founders of the Human Potential Movement sent me a summary of the major mindset shifts taking place at this point in history. What an amazing time to be alive!. Here are Dr. Houston’s five shifts with my comments in italics..
1. We are changing our understanding of who and what we are and what we need to become in order to be able to deal with the complexity of our time. It was Theihard de Chardin who coined the phrase – “we are not human beings having a spiritual experience but spiritual beings having a human experience”. That being the case, there are no limits to what we can achieve. In the same way that we can acquire superhuman strength when in a dire emergency and loved ones are trapped, so can we find the power in ourselves to cope when the stakes get really high – and they are increasing every day. 4. The rise and fusion of different cultures–we are swiftly moving towards a planetary civilization that accentuates the uniqueness of each culture while blending them together. Think of the great fusions of food and of music and of beliefs. Now if travel & tourism had a higher purpose, then this is it. But we won’t make our contribution to building a planetary civilisation so long as we continue to displace vulnerable cultures in our attempts to secure the few remaining unspoiled, remote spots of beauty left where indigenous cultures have existed for thousands of years. To be involved in travel means to care about the disappearance of a language every two weeks and to speak out where the actions of the travel community have created injustice. 5. Whole new orders of spirituality are emerging that are not about religion. The new cosmologies are giving us a view of ourselves that we never had before. For the first time ever, we find that we don’t live in the universe, but that the universe lives in us. In other words, for the first time in human history we’re consciously aware that our own evolution as a species is in our hands and not left to random chance. That’s both wildly exciting and terrifying. Isn’t that enough to jump out of bed with passion and enthusiasm? Time to wake up folks. Fresh, organic coffee lovingly grown by a cooperative is brewing! It doesn’t matter whether you get involved in Responsible Travel, Sustainable Tourism, Green Travel, Geotourism etc. what matters is that you participate and take a stand for what you believe in.